​Percy John Bradley was born on 3 June 1891 in Sutton Bridge, Lincolnshire. He was the third son and fourth child of Samuel and Elizabeth Bradley. The family moved Frampton soon after he was born, and his father set up a building and decorating business based at their home, Lake Cottage, Lake Lane. By 1911, Percy was employed as a bricklayer. Percy and his older brother, Francis Hugh, both served in the war, but no records have been found of their service. 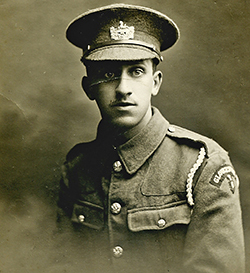 Percy initially joined the Gloucestershire Regiment but later transferred to the Royal Engineers as a sapper, presumably to make good use of his skills, and family members understand that Percy was at Ypres. He was awarded the British War Medal and Victory Medal and his service is also commemorated on the plaque in Frampton Village Hall. Percy became a Comrade of the Great War in 1919, and also maintained links with the Old Comrades Association of the 35th Divisional Signal Company of the Royal Engineers. After the war Percy continued to work for his father. He was a keen beekeeper and met his future wife, Margaret Elizabeth Cook, at Whitminster House where he was looking after the bees and she was working as a lady's maid. They were married on 21 July 1929 at Guiting Power and had four daughters: Olive, Margaret, Rosa and Sylvia. Percy John Bradley died in Frampton on 26 July 1971 and was buried next to his father in St Mary's churchyard.